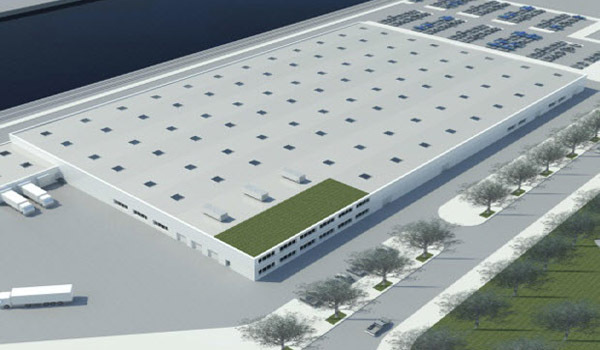 Lufthansa Technik AG is investing almost 60 million euros in the construction and equipment of a new wheels and brakes shop at Frankfurt’s East Harbor. The new building will be put into service at the beginning of 2017. It will enable Lufthansa Technik, as the world’s leading provider of technical services for the aviation industry, to continue to grow in the segment of wheels and brakes maintenance. Lufthansa Technik is thus securing the 130 qualified jobs that already exist in Frankfurt and is also creating opportunities for further growth. The aim is to equip the building with state-of-the-art technology in order to exceed the requirements of the German Energy Saving Ordinance by 30 percent. From spring 2015, an ultra-modern workshop with a gross floor area of 14,500 m2 will be built on a 35,000 m2 plot at Frankfurt’s East Harbor. Operations are scheduled to commence as early as the beginning of 2017. Thanks to optimized processes, tailored logistics and state-of-the-art plant equipment, the new site optimizes the supply of wheels and brakes for Lufthansa’s flight operations. In addition, this opens up opportunities for further growth with customers outside the Lufthansa Group which is already strong. The workshop’s layout, together with a high degree of automation and optimum machine utilization, will further enhance Lufthansa Technik’s competitiveness. The existing workshop at Frankfurt airport has long exceeded its capacity limit: Originally built for 15,000 wheels and 2,500 brakes, meanwhile more than 26,000 wheels and 4,500 brakes per year are now repaired there. The freed up space will be used by other Lufthansa Technik units in the future. Due to the high levels of stress they are subjected to and their importance for the safety of flight operations, aircraft wheels and brakes require a significant amount of maintenance. Lufthansa Technik takes care of all the necessary work – from wheel or brake changes to small repairs or complete overhauls. Every wheel or brake passes through numerous stations until, after a thorough check in accordance with internationally applicable aviation regulation, it is approved in the final inspection.